There have been rumors that the Galaxy S8 could arrive with an S Pen when the phone launches this year, and some new photos sent to TechRadar claim to confirm just that. However, on closer inspection we believe the photos - provided by MobileFun - do not confirm a stylus for the flagship smartphone. Along the bottom of the case are three holes, which MobileFun claims are spaces for the speaker, headphone jack and stylus. Thing is, if this were true it would mean Samsung would have to drop the USB port on the Galaxy S8 - a move which is highly unlikely considering the reliance on it for charging and transferring data. The retailer goes on to claim that the S8 would instead rely on wireless charging, and while we're not ruling out this feature on the new handset we're pretty sure it would still be a secondary option to the traditional wired connection. We'd wager that the change Samsung will make here is upgrading (finally) from microUSB to the reversible USB-C connection - pulling its flagship Galaxy S range in line with the top phones from LG, HTC, Sony, OnePlus, Google and Huawei. A move which has been rumored numerous times already for the Galaxy S8. A stylus doesn't make sense for the Galaxy S8 either. The phone is a mass consumer device with wide appeal, while the S Pen has a much smaller fan base and is reserved for devices with bigger screens (such as the Note series) which allow you to make the most of the input tool. The good news from this leak is further evidence that there will be a 3.5mm headphone jack on the Galaxy S8 - which will surely please audiophiles. The top of the case (which itself isn't verified, but is similar to another case leak) has another slot, which we expect to be space for the microphone and/or SIM tray. On the back is an opening for the camera and another just above for the flash. MobileFun also included the above photo of the "Galaxy S8 Plus" case, a name we haven't heard floated around for the new Samsung line up of devices - and another point we're a little dubious about. 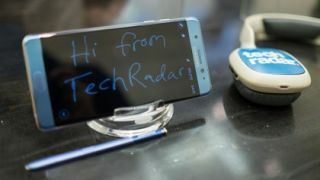 Samsung did release the Galaxy S6 Edge Plus back in August 2015 as an alternative to the Galaxy Note 5, but 2016 saw it replaced by the smaller Galaxy S7 Edge and global availability of the ill-fated Note 7. All the rumors so far suggest Samsung will be sticking with its 2016 naming convention, so expect to see the Galaxy S8 and S8 Edge. We're not ruling out a S Pen accessory for the phone completely though as rumors over Christmas suggested the Galaxy S8 was originally designed to come with an S Pen, but the idea was reportedly dropped in favor of an add-on stylus. That means it will be an additional accessory available from Samsung at an extra cost, so won't slot into the phone. It does sound unlikely, but it's a stronger argument than an integrated stylus in the S8 itself. We have contacted MobileFun for more information on the cases, and whether its source is able to provide any clear evidence of the S Pen arriving with the Galaxy S8. We'll update this article once we've had a response.